While we’re fortunate enough to live in the Sunshine State and be able to play outside for a good portion of the year, spring makes us want to live outside and we do. From the beach to BBQ’s to picnics and beyond, April starts the outdoor adventures. While I’d love to give you tons of cool things to do outside this spring other than working up a sweat exercising, I’m not that gal (but I have a feeling that blog post is coming). Instead I’m giving you four of my favorite Jacksonville parks to frolic in! At 114-acres, Ed Austin offers all the amenities you need for an athletic child or the kid that just needs the room to run around. It has more soccer fields than I am even aware of, baseball fields, a skateboard area, a 1.75 mile paved (mostly shaded) path, basketball courts, two playgrounds and anything else you can imagine a kid (and some adults) would love. There is even a Frisbee Golf course. I had never heard of this game before, until I visited this park. Apparently it’s a very popular sport and I’ve seen many a dad pack a stroller (minus the kids) with a box of frisbees and throw their way through the park. But I have to say the path is by far my favorite part. There aren’t many parks that can offer that big of a paved route to run, walk, ride your bike, walk your dog, chase your kids or do whatever you feel like doing! Located minutes from the beach, South Beach Park is a bustling little park with one of the coolest playgrounds I’ve ever seen. My husband says it looks like something out of Harry Potter and it’s certainly just as exciting to meander through. My little one is a swing girl so she goes bonkers over it’s many swings. When she gets tired of that she loves sliding down the more than five slides! Once the weather gets a tad warmer, South Beach Park will open it’s splash park, a new water tower that squirts out water at giggling kids below. This is a great stop if the kids want to play in water but you don’t quite feel like packing up for a beach run. South Beach park also has a ¼ mile paved loop, 3 volleyball courts, a tennis court, basketball court and a giant field. In the evening, this park fills up with soccer games, pre-bed time playing, adult basketball and volleyball games and late night exercisers. At first visit to this Mandarin park will you’ll feel like you’re in the country. 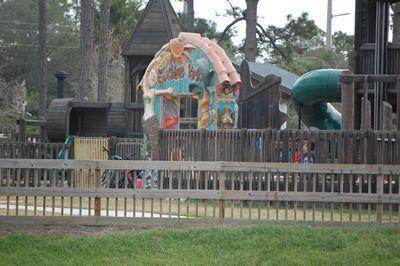 Located just off Philips Highway, Losco Park is a little oasis in the middle of a busy spot in Jacksonville. You’d never know you were so close to the main road as this park offers a quiet atmosphere complete with a scenic paved trail that wraps around the wooded park, one multi-use field, soccer fields and two playgrounds – one for toddlers and one for older kids. Losco Park is probably the smallest of the parks I’ve mentioned but with all of the open space you wouldn’t know it. It’s also one of the most shaded. I’m not sure what it is about this park but it’s just plain fun! Maybe it’s because it’s in the adorable Atlantic Beach area or because the kids seem to go wild over the little playground, but whatever it is, Jack Russell is one of my favorite parks. Much like the other parks I’ve mentioned, Jack Russell has multiple tennis courts, racquetball courts, soccer fields, baseball fields, playgrounds and even a huge skate board park. It also has a great picnic pavilion perfect for birthday parties (reservations only) and directly across the street are wooded running paths (not suitable for strollers but older kids might enjoy dodging logs). I do have to give a little warning about this park. It is located right next to a busy road with a less than adequate fence but I do know a few moms who actually feel safer at Jack Russell because everything is pretty contained and not so spread out. To learn more about parks in Jacksonville, or to find a park near you, visit the City of Jacksonville’s JaxParks website. This blog was originally posted on www.jaxmomsblog.com. Check out their site for other exciting kid friendly blogs and activities.